Adinkra cloths are made in Ghana. First made as mourning cloths, they came to be used for other occasions as well. Kings and rich people commissioned cloths to speak of their power. People embarking on a new venture, such as starting a business, might commission a cloth. Most cloths are printed, although some are appliqued. The stamps for printing are cut from a gourd. The black dye is a mixture made from the boiled bark of the badie tree and an iron-rich stone. The dye is called adinkra, which means farewell. The symbols used in printing have a long tradition and deep significance. Through the symbols, each cloth communicates information about the owner, living or dead. The symbols are so much a part of Ghanaian culture that they are often used by the government and clergy. The logo of the Standards Board in Ghana is the measuring rod, which stands for excellence and intolerance of imperfection. I used one-half of the back panel of a grocery bag for the pages and the front panel of a cereal box for the covers. I covered the covers with paper cut from the other half of the grocery bag panel. 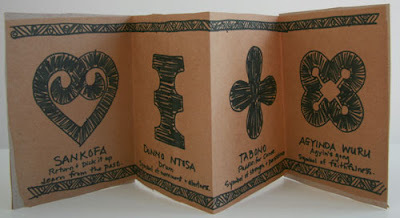 You can use this pdf from Multicultural Books To Make And Share to make patterns to trace for your own adinkra symbols book. They are designed to be traced on a folded piece of paper, then cut and opened to form the complete pattern. I traced the patterns with pencil and then outlined and colored them with black marker. For a longer book, you can follow the directions for attaching sections in the directions for the Index Card Accordion. This website was created to accompany a book for educators. Of particular interest are the image pages which include cloths and printing blocks, production, and uses of the symbols. African- American Amber visits her Aunt Phoebe whose house is full of things Amber's father calls junk and her aunt calls her "collection of life." Amber's favorite is an adinkra cloth from Ghana. There are descriptions of the cloth and the meaning of some of the symbols. Amber imagines the cloths she would make for her family. Thanks for the great books to make! I made the palm leaf books with a group of children at the Woodbury Public Library in CT. They were a big hit and the kids loved the bead closures. Your website is really great - thanks for sharing.